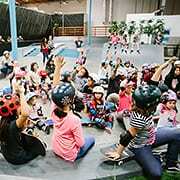 The Skate Rising program aims to inspire confidence in female youth through skateboarding and to encourage compassion through community service projects. This combination allows each girl to recognize her ability to make a difference within herself, her community and beyond. Knowledge is power and one of the most important tools to our success in life. We teach our participants about real-world issues in their community and how to address those issues. Common areas of focus include: anti-bullying, individual worth, poverty and homelessness. When given the age-appropriate tools to navigate sensitive issues, girls grow up to become stronger, more confident in their convictions, and more willing to support those around them. By engaging youth in community service projects each month, we build a foundation for compassion, kindness and appreciation for humanity in the next generation of leaders. When girls take part in confidence-building service opportunities, they develop strength and self-worth while serving others. We believe our generation should be learning to give back to their communities in a positive and meaningful way! Skateboarding is the perfect conduit for teaching hard work, perseverance and patience. Skateboarding empowers girls to push past barriers while encouraging self-improvement through practice and determination. It requires dedication and focus and is an ideal sport to foster a community of friendship and teamwork. Skate Rising always encourages girls to help each other on and off the board and it shows through the awesome positivity we see at the skate park each month!